Click on the Apple icon in the top left of your screen. In the window that comes up, under the title "Mac OS X" there will be a version number. 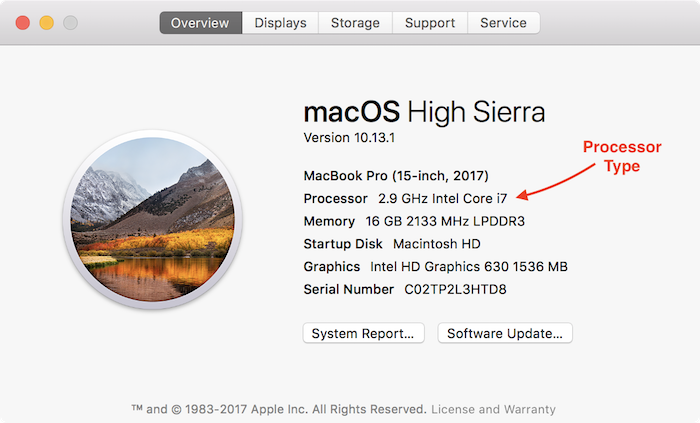 If it starts with 10.13, you have High Sierra. If it starts with 10.12, you have Sierra. If it starts with 10.11, you have El Capitan. If it starts with 10.10, you have Yosemite. If it starts with 10.9, you have Mavericks. If it starts with 10.8, you have Mountain Lion. If it starts with 10.7, you have Lion. If it starts with 10.6, you have Snow Leopard. If it starts with 10.5, you have Leopard. If it starts with 10.4, you have Tiger. If it starts with 10.3, you have Panther. Write down the Mac OS X version you have. In addition, to the right of the "Processor", there will be the a processor type. If it ends with Intel Core i7, Intel Core i5, Intel Core i3, or Intel Core m3 you are good to go. If it ends with Intel Core 2 Duo, you are good to go. If it ends with Intel Core Duo or something else, you are NOT good to go. Please flag down a volunteer. Once complete, you may close the "About This Mac" window. You should try upgrading to at least Snow Leopard. Apple doesn't sell it the Apple store anymore, so you'll have to buy it from them online or find a copy from a friend. It may be possible to get Ruby and Rails installed if your OS is older than Snow Leopard, but you're likely to encounter a lot of tough roadblocks that will require some intense Googling.